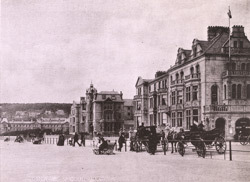 "The Sands And Marine Promenade. - With the two miles of sea wall of massive masonry - itself a triumph of engineering skill and artistic workmanship - a forty-feet Esplanade sweeps round the bay from the Sanatorium near Uphill, past the front of the town, round Glentworth Bay to Anchor Head Cove, where the Esplanade, following the curving sweep of wall and coast, opens up some of the most charming sea views, and on to the Pier; while a magnificent Marine Drive, forty feet wide, divided from the Esplanade by a railing, extends in all four miles by way of the woods to Kewstoke. The Sea Front boasts of the decorative finish which one finds in a fashionable continental watering place... The broad Esplanade...presents a gay and animated scene on summer afternoons and evenings, when crowded with promenaders and full of the 'life and stir and movement' of a holiday throng." This is the fifteenth in a series of 16 cabinet card views of the town published in the book 'Weston-Super-Mare Photographed.' In the 1880s Cabinet Card photographs eventually replaced the smaller carte de visite format. As the name suggests, the cabinet image was large enough to be displayed on a side table or bureau. They remained in vogue until the turn of the century when they were superseded by the photographic picture postcard.